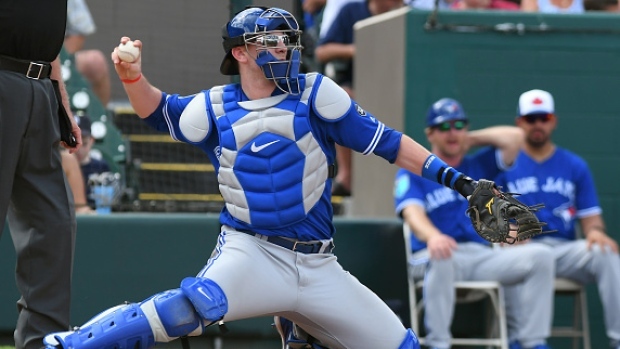 After Yangervis Solarte went down with an oblique injury in Saturday’s loss to the Rays, the Blue Jays made the move to call up their No.3 prospect, Danny Jansen. Jansen was pulled in the middle of his AAA game on Saturday, and has now joined the Blue Jays in Toronto. He was on the bench for yesterday’s game, but I’d expect him to get some game action in the series against Kansas CIty. As the No.3 prospect for the Jays, and the No.73 prospect overall, there’s obviously a lot to be excited about with Jansen. In 88 games for AAA Buffalo this year, he hit .275 with 25 home runs and 58 RBIs. Jansen has also impressed defensively in his 6 year minor league career, only tallying 20 errors, and putting up a .992 fielding percentage behind the plate. Jansen is 23 years old right now and won’t turn 24 until April of next season, so this is about the perfect time for him to be called up. I’m not completely sure what his role will be this season - with Russell Martin and Luke Maile taking the playing time at catcher right now - but I expect Jansen to be the starting catcher for next year’s team. Russell Martin will probably still be on the team next year because of his expensive contract that will be nearly impossible to move, but I think Martin’s role will be diminished for sure. By keeping Martin and Jansen next year, the Jays would be getting rid of Luke Maile - who’s been good this year - but was never a long term option for the Jays. With Jansen starting, I think Martin could do a great job of mentoring the young catcher, while getting in the lineup every 3-4 days himself. Martin could also play some infield for the Jays if they need him to next season. All of that being said, the majority of the playing time behind the plate should go to Jansen next year. As for this year, I’d like to see him start to catch some of the guys that he’ll be partnering with down the road (Stroman, Borucki, and Sanchez once he’s back from the DL). Though it’s not official yet, the Jays are expected to call up another one of their top prospects tonight - No.10 prospect, Sean Reid-Foley. He should be called up to start tonight’s game in Kansas City. After a dreadful season in AA last year where he posted a 5.09 ERA, Reid-Foley has bounced back with a great season. He started the year in AA, where he went 5-0 with a 2.03 ERA. Then in 15 starts in AAA, he went 7-4 with a 3.50. So overall, he has a 2.98 ERA between the 2 leagues this season. Like I mentioned earlier, Reid-Foley will start against Kansas City tonight. The Royals are 35-81 right now and in the middle of a rebuild. I think it’s a good thing that he’s able to make his debut against such a bad team, because he’ll be able to sort of ease his way into things before his next start, which will be at Yankee Stadium. With both Jansen and Reid-Foley both being called up, a lot of fans are begging that the Jays bring up Vladimir Guerrero Jr. as well. Guerrero is currently mashing in Triple-A, hitting .405, with 4 home-runs in his last 4 games, and has also made some nice plays at 3rd base. Now, I understand why there is outcry for Vlad Jr. in the big leagues from some fans. I mean, there’s still about a month and a half left of the season and people are just looking to get excited about something. The Blue Jays are not playing good baseball at all right now with their current roster, so a lot of fans want to see this super-prospect up and playing in order to bring some life back to Jays. Bringing Vlad Jr. up right now would definitely make the 2018 Blue Jays a better team, but there’s no reason to do that at this stage of the season. The Jays aren’t even close to the playoffs, so even if they were to go on an improbable run behind Guerrero and company, it wouldn’t make a difference, and they’d be wasting a year of Vlad’s service time. Instead, the Jays should keep Vlad in the minors, and bring him up in mid-to-late April next season, in order to keep the extra year of service time, and get him in the lineup for most of next year. Newer PostHow Do the Blue Jays Spell Success in the Remaining Games?